At Belton-Honea Path Water Authority, our goal is to provide safe, clean, sparkling water to all of our residents! 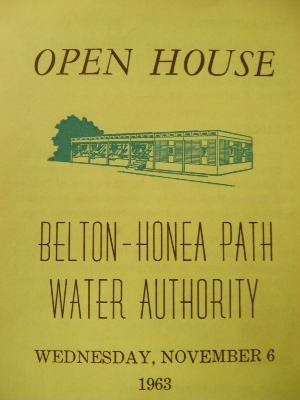 The Belton-Honea Path Water Authority was created by an act of the South Carolina Legislature in 1961, and was signed into law by then Governor Ernest "Fritz" Hollings on March 1, 1961. The purpose of the Authority was to construct a filtration plant and system that would provide an adequate water supply for Belton and Honea Path and to patrons in a 40 square mile area between and adjoining the two cities. The first steps in planning the creation of the Water Authority were taken by the Anderson County Developement Board, when joint meetings were held with city officials of both cities as early as 1960. Members of this board who aided in the realization of the system were Charles R. Johnson, Jr., Chairman, Anderson; W. Parker Bowie, Starr; V.A. Boyd, Pendleton; Guy G. Cromer, Anderson; C.B. Drake, West Pelzer; R.C. Longshore, Belton; George H. Herbert, Pelzer; W. Keys Welborn, Honea Path; Louie J. Moore, Iva; David Wakefield, Secretary, Anderson; and Berry Davenport of Williamston. Officials serving Honea Path during the establishment of the Authority were James R. Guest, Mayor; Grady Meeks, Jr., Carl T. Ripley, Wayne S. Traynham, Leon Thornton, Roy Johnson and Larry Young, Alderman. Officials serving Belton when the Water Authority was planned and established were R. Glenn Coward, Mayor; Gary F. Thomas, James C. Mattison, L. Clayton Jones, J.W. Stephens and J.C. Thompson, Aldermen. Serving Anderson County as members of the South Carolina Legislature, and who introduced and passsed the Act of creating the Water Authority were John C. Taylor, State Senator; T. Ed Garrison, Daniel L. Castles, M.E. McDonald, William L. Thompson and William J. Wright, House of Representatives. The Belton-Honea Path Water Authority is now operated by a Board of seven members but was originally operated by five commissioners that were appointed by the City Councils of Belton and Honea Path. Those original Commissioners were J.L. Gassaway, Belton; P.M. Washington, Honea Path; Julius A. Blake, Belton; R.H. Hope, Honea Path and James H. Shirley of Honea Path. The water treatment plant was originally designed to produce nearly 2,000,000 gallons of water per day, or 2 MGD. As Belton and Honea Path grew not only in population but also in industry and business, demand increased. With the addition of Donalds Due West Water Authority in May of 1975 the treatment plant expanded its capacity to nearly 4 MGD which is where we stand today.